Darune Academy, a place for those with magical talent. Located  in the north of it's continent , there are five houses. It's always been a safe place for those who attend. With it's classes taught by Council of 13 picked teachers, walls protected by powerful spells, and ancient roots, it has always seemed like an unbreachable  fortress. But when 5 students, each from very different backgrounds arrive, strange things begin to happen. The gods and goddesses of legend show themselves, creatures of evil appear out of nowhere, students have strange blackouts and visions, odd natural disasters strike, rumors of a group set on destroying magic surface, and ceremonies dating back centuries are disturbed, people begin to think something malevolent is going on. 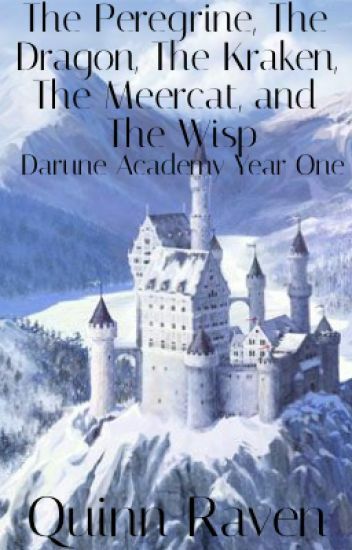 The first book in the Darune Academy series. Willow thought her biggest concern was keeping her nightly chats with the selkies and nereids a secret from her mother. That is until her new science teacher ends up being an evil warlock, working for the king of the Underworld. Hellbent on using the magic of the Salem witches against them, he will stop at nothing until the Underworld is free to roam. Wanting nothing more than to complete her eighth-grade year in peace, Willow doesn't want anything to do with stopping a warlock. That is until a moon goddess asks for her help, personally. Can Willow and her best friend, Sage, stop an evil warlock from destroying their world? All without their parents finding out? Humans of this day think that things like elves, fairies, nature spirits, and magic in general aren't existent....but what if they were? Hidden, yes, but perfectly real, just as they were long ago. Even to you, they may have been hidden. That is, until you received the letter. A letter that told all about the world of magic and invited you to this school, this Elemental Academy. To train your powers, to make friends of your kind, and to do so much more....enroll now, and you will unlock countless secrets, ones that you have never even dreamed of. A thousand year ago there once was a prophecy that very few people believed. "Many people received powers from god, but only four are most powerful. Hidden in the human race the Elementals survive. Fire, water, earth and wind, all of them combined. The four most powerful of each element born at midnight, they will save the world from destruction and chaos." What happens if an evil Ice Queen is on the loose? Well Rebecca Pleaseanswer and Brandon Whatthewhat with some other kids know. Not sure if this story will be finished by the way. Please comment in what you think about it. Welcome to Magic Academy, school for the magic-inclined! We are currently accepting students and teachers! Here at magic academy, we foster a large variety of supernaturals. From shape shifters to angels, from mermaids to fairies, you name it, we have it. Our diverse campus fosters excellent students who excel beyond their schooling. Feel free to drop by our academy whenever you want! To join, just fill out an application sheet! Felicia Quinn is a Winter Element. Like all Elementals, they have to go to Elemental High. In Elemental High, they learn to manipulate their powers to defend themselves--from what, nobody knows exactly. Yet. Then Darrell Arrica comes to Element School. She is unique, she doesn't have any of the ten elements. Her element is darkness. Suthih, an evil empress, is one of the only other Darkness Element left. She and her Dark Devoters want to kidnap Darrell because she has strong darkness powers and is one of the only ones who can defeat her forever. There's something happening at Winter's Academy. So what does a school full of magically gifted students do? Pica is beyond ecstatic at learning she's the Light Elemental; she just as thrilled at realizing her idol will be traveling with her. The way Aeris acted doesn't get her down for long; even though she wonders why she'll find a way to make the Priestess of Air accept her. In his longing for knowledge, Tegen joined the Elementals to see and learn even more of the world. Being chosen as the Earth Elemental never influenced his decision-it did not intrigue him as to why. At least, he did not think so.